“It is really playing with a gigantic powder keg in the middle of three million civilians”. These were the words of Jan Egeland, the United Nation’s humanitarian advisor for Syria, on his final day in office last month after chairing his last meeting of the UN’s humanitarian task force. In between, we saw talks which veered from high drama to farce to – let’s be honest, boredom – at least for me and many journalists. There were times when one or other delegation said they would come to Geneva but then didn’t. There were times when people stormed out. 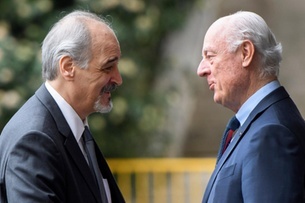 They rarely even met in the same room: Mr de Mistura and his predecessors had to scuttle, like weary medieval messengers, between them.